Tried the Limmerick Ham sandwich lunch special at Majestic in honor of St. Patricks day. It was actually a notable ham sandwich, adding an egg spices everything up and dubliner cheese is really good stuff. Heard good things about the other specials that week. Funnily enough specials can be really good even at a restaurant that is otherwise frequently so-so. Also had the corned beef and cabbage special at silly goose on St. Patrick's day. Was very solid. The cabbage seemed uncooked which was odd, but actually went well with the corned beef. Went to urbannexus where they had a series of four minute presentation, perfect for my limited attention span. Hosted by Mpact memphis and the lovely Gywn Fisher (the woman in the photo) it went by quickly as all good presentations do who made a freudian slip that made everyone laugh that she made me promise not to publish it . (I'm fond of rhymes as an unrelated note). (Memphis is apparently a very inspirational place to live- lots of stuff to fix!). What followed was a really nice reception with notably good tomato and some kind of cheese puffs, cheeses, and sate chicken spears. The cookies and brownies were not that great:(. Hmm, what did I do this weekend. Normally I try to shy away from narrative time based posts. Seems more diary like and overly personal. However, I'm short of ideas and I feel I should give Le Chardonay 1 more review before castigating them. Starting with Monday went to Silly Goose for their Depression era pricing happy hourw which also offers depression era cool drinks like manhattans and sidecars all for a dollar. It was for an Mpact memphis infusion event, which was designed to get a small group of us introduced to each other at a happy hour so that when we go to an Mpact happy hour we would have a core group of people we know. Since they had separated the boys and girls for this one (much like preschool) we came up with ideas for future events like gun shooting and poker. Had spotted for one of the five guys at the Y once small world. Later in the week I did some forgettable stuff, not entirely sure. Worked a bunch. Oh yes went to the masons twice that week which is notable cause I hadn't made it for awhile being too busy with Mpact happy hours and ptolemy social events. Friday I went to Molly La Fontain Lounge which was a really cool place right across from juvie. Saw the food others we're ordering and looked at the menu. Closest to a true tapas place I've seen in Memphis. Had the slider which was really really good. Went to Bardog later in the night and while there's is good, Molly was better though twice as expensive so a different experience. Later went to see OmyGosh Prat or something similar practice with the Memphis symphony orchestra which was interesting though overly modern and segmented for my taste. Had very good chocolate dipped strawberries and the reception beforehand. Rode Ptolemy's St. Patrick day float and threw out some beads some other members were thoughtful enough to bring. my candies were not well received. Memphis is definitely a cheap plastic shiny object town. Later went out to Windjammer and saw Machine Gun Kelly a Roller derby girl who asked me if you could park in one of the spots of the adjacent businesses. I said it wasn't posted but what did I know. Windjammer being different and overly loud I then went to Celtic and both sets of friends I met up with complained about the place being overly loud. We then mused that no place in memphis that was any good wasn't overly loud except a few patio places in the summer. Went home and watched Employee of the Month which was a little tame. Also call your senator on senate bill 61 for bankruptcy backed mortgage modification so I can make money! Dad was in town Tuesday night, so I took advantage of the opportunity to try out that place you never goto in the back of the Sanderlin center Napa Cafe. The place was very very busy which surprised me given the state of the economy and no one else appeared to have a restaurant.com gift certificate. We started with the fried artichokes which were really good. Every piece was near perfect and it was the normally excess portions of fried food. In addition there were spiced pancetta and other add-ons that made it a very exciting fried artichoke. We both next had the soup of the day which was french onion. It appeared to be a slighty sweet and sourish vegetarian broth which made it an okay but not stellar french onion. Dad had the filet medallions with the port wine reduction and some roquefort spiked mash potatoes. I had a bit and it was near perfect and a stellar dish. I had braised short ribs with a leek vegetable. I found it a little undercooked and not quite soft enough. The leeks and spinach were really good. The ribs needed some sort of sauce to kick it up a notch. The best short ribs I ever had were at the hilton millenium in new york which featured a crusty exterior near mushy interior and a sauce quite like the port wine reduction. Dad and I both looked at the desert menu but nothing seemed compelling but it was a varied list so any sweet tooth should be satisfied. The waiter asked if everything was okay and when presented with the pocket version of the above a correlation between time on the menu and quality of the item was apparent. So it might pay to ask how long they've had any item contemplated. Much lauded place I've never tried downtown. The first time I went AC Wharton was present. Thought about asking if he wanted to be my new obf but decided against it, and after the last time I think if we try that again it will be in another city. Had the vegetable plate which was quite good. The much lauded Turnip greens were indeed quite special. So were the sweet potatoes. Had the peach cobbler for dessert which seemed solid. The second time I tried the meatload, which was decent considering I'm not a meatloaf fan. The gravy lacked the typical tomato of most meatloafs which I liked as I find tomato sauce and meat to clash in many cases. The corn bread sticks were nice and crunchy as well. The split pea soup I had before was also quite hardy. I liked how the broth was quite salty, which means it probably will be too salty for most people. I also pondered how a lunch plate place calls itself a tea shop and wondered if it evolved from the Southern urge for faux aristocracy. Took some time on a Wednesday to go to an issue forum presented by MPACT memphis on how the media presents Memphis and if all Memphis suffers from is poor press which causes a vicious cycle of more poor press. I found the panel to be very well informed, but somewhat basic. I think the panel suffered from trying to communicate on an eighth grade level most of the time, which was one of the issue mentioned by some of the question asking people. The TV guy was surpised that TV was a powerful medium that could singlehandly form public opinion, which when he voiced wonder at this most of the audience shouted out in the affirmative it was that powerful which was if anything moderately amusing. The memphis flyer guy was against anonymity in journalism and anywhere else and thought people should stand behind there opinions, which I personally find to be a common view nowdays but historically anachronistic from the founding father's days of anonymous editorial columns. Personally, I think everyone should analyze things on their own merit without allowing others of a more credible stature to dictate their worldview and I find anonymous opinions to be good for that. It's a shame that people believe ad hominem attacks and other scandalous or salacious material in an anonymous missive however. I've noticed that at most events the length of public questioning has gotten extreme. I think writing questions down might be a good panacea for the problem. I joined MPACT last month and I really really wish I had joined the moment I moved here. It's group for young professionals to network. In addition, its one of the few ways I've found to escape the high school cliquishness that is pervasive around here. 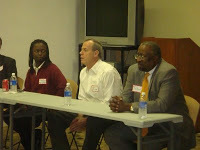 The website is www.mpactmemphis.org and they also have a good facebook page. Stumbled into the restaurant behind one of the smoked turkey leg storefronts on Beale. Was surprised though it was just a turkey leg front. Turned out to be a soul food fried chicken and Waffle place called Mrs. Pollys. Wasn’t eating but the people who did said it was quite good . Went back with dad for dinner the next day. Had the trademark fried chicken which was very good , honestly I though better than Gus’s . The turnip green side was also solid. Dad enjoyed his hamsteak and eggs. Had the skillet fried apple pie which was solid. Memo if you get it ask for the ice cream on the side so it doesn’t slide off onto the really hot skillet. Then give the pie a little time to get crispy on the skillet. It obviously was initially heated in the nuker. Listened today on the radio briefly to commentary on how liberals were comparing Obama to Jesus Christ and engaging in idol worship as they tried to wipe out Christianity. The only prayer I say to Obama is for bankruptcy based mortgage modification having taken out a half page ad in the yellowbook for next year. I thought this was an interesting demonstration of black and white thinking and wondered at all the empty small churches around demonstrating this crisis as they retreated to massive edifices with coffeeshops and dedicated daycare for protection against the liberals. I also wonder were all the readers have gone given the shrinking number of small bookshops. As Obama took I office I noticed the DOW was flirting with the important 8000 level. I think this represents exactly how deep the systemic problems now run. However, unlike the great depression, our government is directly turning on massive economic stimulus before the problem gets out of hand. Many point to Japan’s malaise as evidence this doesn’t work, but Japan has a massive shrinking demographic absent here where the population is growing at a steady low rate due to immigrants performing useful functions like nurses, doctors, and salespeople, though some go to law school and become a burdensome leach on society, which is something that should only be done by unfocused WASP’s. In fact why don’t we make all the lawyers retake the bar and make the lower ¼ go to nursing school. I’m game. I like tests. Lavoro’s has reportedly taken my pizza comments to heart and I plan to rereview eventually. Went back to Old Venice and while the cheesesteak’s had slipped I noticed it apparently had acquired a really happening bar scene. Speaking of bar food, the notables so far are Kudzu’s for bacon cheeseburgers, Flying Saucer for Pretzels, Young Avenue for the fries and a generally all around solid fare except for the cheese logs which while admirable attempt at bigness are simply too big to become appropriately gooey through and through. Speaking of Memphis. I’m over my first year infatuation. While I still don’t think its quite as bad as often accused, it’s a bit of a drag. I find its somewhat insular and for some reason everyone is hanging out with their high school friends. Read on quick facts on the us census data that above 26 with bachelor’s degree is only 20% as opposed to 30% in Dallas or Nashville. Reviewed the Tennessean on the Downtown Square in Collierville with a Highly Blond Associate (HBA). After circling the square several times trying to figure out where to enter the rail cars, I started with the seared Foie Gras Appetizer which was really good, perfectly seared and retaining a consistent duckiness without being overpowering. HBA had the Benne Seed Shrimp which was excellent jumbo tempura fried shrimp with black and white sesame seeds. HBA also had the Caesar which she commented was quite nice. I had the Charleston She Crab soup which was jam packed with crabmeat and had a light creamy broth and some nice sherry on top. The thick biscuit served as the bread to start was nice and flavorful but didn't really compliment the scallops. For Entrée I had a seared scallops in a mushroom gravy. The scallops were excellent and done perfectly . The mushrooms complimented them perfectly. The only thing missing was a bit of starch which I’m trying to avoid but seemed called for. HBA had the duck breast fettucini which she also thoroughly enjoyed and said went well together. HBA had the cream cheese chocolate chip brownie desert which had a burnt taste that was remedied by a lovely cream brulee that was quite solid. On leaving we were shown the lounge car where you can book a killer private party. Found a shockingly good cheap Italian place off Sycamore view at Summer www.lavorosmemphis.com . First time I was about to head for coffee and needed some food so I went into a fast foody type building looking to be disappointed. I was pleasantly surprised which some great handbreaded cheesticks with a light breadcrumb breading that were delicious and possibly the best in Memphis. (Current cheesestick rating Old Venice and Lavoro tie, Romano's fried wedges a solid third). and a solid Italian Panini. Leaving off for Nashville for a cle and a depo I stopped on my way out. 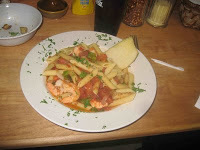 Had the shrimp penne Napoli which was excellent. The croutons on the Caesar were a bit stale. The place was excellent and the prices a flashback to the 90’s. Went and tried the pizza with the Grey formerly the Red and if Tolkien is followed eventually the White. Unfortunately this seems like an entrée type for dinner place. GRW commented it seemed overly sauced, a bit spicy, and light on the cheese. All comments I’m afraid I must agree with. In addition the crust was a bit soft to be a thin crust pizza which it was. Perhaps if lighter sauced or cooked longer things might have pulled together better. Overall a great laid back dinner option.